If you have a storefront, logo signage is a must to create brand identity, advertise your business, and help customers find your location. But even if you don’t have many customers coming to your actual location, building signage is just as important. 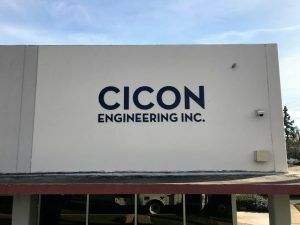 Cicon Engineering is a manufacturing company with a location right here in Chatsworth, California that contacted us for some building signage. They had an existing location in Van Nuys with a building sign and they wanted something similar for their Chatsworth location. We took a look at the existing sign and saw that it was a non-illuminated dimensional letter sign. A letter that is 3-dimensional and doesn’t need to be illuminated can be made from many different materials. The 3 main options are plastic, metal, or foam. The type of plastic we use for our signage is usually acrylic. Acrylic is very versatile because it already comes in different color options, can be painted, and we can also apply a metal laminate to the faces. If the client is looking for a metallic look and wants the letter to be solid metal, we use aluminum. Aluminum is lightweight and can be painted, anodized, or color anodized. Anodizing aluminum makes the material harder, more durable, and less likely to corrode. We can also give aluminum different finishes. The most common finishes are brushed or polished. We can also make channel letters that are made from all aluminum without LEDs inside of them. We form the letters in-house and we can give them a metal finish or paint them any color you want. 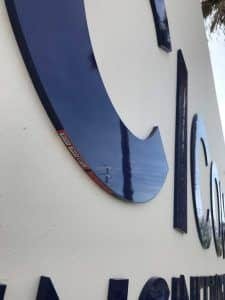 A common reason a client will ask for non-illuminated channel letters is when they want their letters to be very thick. Our reverse channel letters are 3 1/2″ deep. There are many businesses that use foam for their building signage but we do not recommend using foam for outdoor signs. It is a cheaper option which will save you money initially, but it will not hold up as well as acrylic or aluminum so you will need to replace the sign a lot more frequently. We ended up going with acrylic dimensional letters because they wanted navy lettering and possibly a print of their logo. Our plan was to contour cut the outline of the logo and apply a digital print on the face, but the client decided to opt out of the logo and just have letters that read “CICON ENGINEERING INC.”.